Identify objects using TensorFlow deep neural network. TensorFlow is a popular neural network framework. This module identifies the object in a square region in the center of the camera field of view using a deep convolutional neural network. This module runs a TensorFlow network and shows the top-scoring results. In this module, we run the deep network on every video frame, so framerate will vary depending on network complexity (see below). Point your camera towards some interesting object, make the object fit within the grey box shown in the video (which will be fed to the neural network), keep it stable, and TensorFlow will tell you what it thinks this object is. Note that by default this module runs different flavors of MobileNets trained on the ImageNet dataset. There are 1000 different kinds of objects (object classes) that these networks can recognize (too long to list here). The input layer of these networks is 299x299, 224x224, 192x192, 160x160, or 128x128 pixels by default, depending on the network used. The networks provided on the JeVois microSD image have been trained on large clusters of GPUs, using 1.2 million training images from the ImageNet dataset. Sometimes this module will make mistakes! The performance of mobilenets is about 40% to 70% correct (mean average precision) on the test set, depending on network size (bigger networks are more accurate but slower). This module takes a central image region of size given by the foa parameter. If necessary, this image region is then rescaled to match the deep network's expected input size. The network input size varies depending on which network is used; for example, mobilenet_v1_0.25_128_quant expects 128x128 input images, while mobilenet_v1_1.0_224 expects 224x224. Note that there is a CPU cost to rescaling, so, for best performance, you should match the foa size to the network's input size. mobilenet_v1_0.25_128_quant (network size 128x128), runs at about 12ms/prediction (83.3 frames/s). mobilenet_v1_0.5_128_quant (network size 128x128), runs at about 26ms/prediction (38.5 frames/s). mobilenet_v1_0.25_224_quant (network size 224x224), runs at about 35ms/prediction (28.5 frames/s). mobilenet_v1_1.0_224_quant (network size 224x224), runs at about 185ms/prediction (5.4 frames/s). To easily select one of the available networks, see JEVOIS:/modules/JeVois/TensorFlowEasy/params.cfg on the microSD card of your JeVois camera. 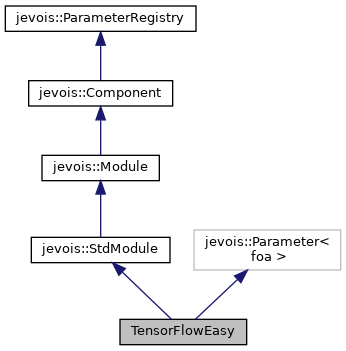 For a step-by-step tutorial, see Training custom TensorFlow networks for JeVois. Then you just need to create a directory under JEVOIS:/share/tensorflow/ with the name of your network, and, in there, two files, labels.txt with the category labels, and model.tflite with your model converted to TensorFlow Lite (flatbuffer format). Finally, edit JEVOIS:/modules/JeVois/TensorFlowEasy/params.cfg to select your new network when the module is launched. Definition at line 141 of file TensorFlowEasy.C. Definition at line 148 of file TensorFlowEasy.C. Definition at line 156 of file TensorFlowEasy.C. Definition at line 162 of file TensorFlowEasy.C. References jevois::rawimage::cvImage(), jevois::RawImage::height, itsResults, itsTensorFlow, LINFO, jevois::rescaleCv(), jevois::StdModule::sendSerialObjReco(), and jevois::RawImage::width. Definition at line 208 of file TensorFlowEasy.C. References jevois::rawimage::cvImage(), jevois::rawimage::drawFilledRect(), jevois::rawimage::drawRect(), jevois::RawImage::height, itsResults, itsTensorFlow, JEVOIS_REGISTER_MODULE(), jevois::rawimage::paste(), jevois::RawImage::require(), jevois::rescaleCv(), jevois::StdModule::sendSerialObjReco(), jevois::sformat(), jevois::Timer::start(), jevois::Timer::stop(), to_string(), jevois::RawImage::width, and jevois::rawimage::writeText(). References jevois::rawimage::cvImage(), jevois::rawimage::drawFilledRect(), jevois::rawimage::drawRect(), jevois::RawImage::height, itsResults, itsTensorFlow, jevois::rawimage::paste(), jevois::RawImage::require(), jevois::rescaleCv(), jevois::StdModule::sendSerialObjReco(), jevois::sformat(), jevois::Timer::start(), jevois::Timer::stop(), to_string(), jevois::RawImage::width, and jevois::rawimage::writeText(). Definition at line 306 of file TensorFlowEasy.C. Definition at line 305 of file TensorFlowEasy.C. Referenced by process(), and TensorFlowEasy().